Emma Brookes was reported missing at 6pm by her mother. Depressed after her exams and with very pushy parents, she doesn’t believe she’s done enough to satisfy them. She’s suffered previous episodes of despondency under similar circumstances and has self-harmed in the past. Emma doesn’t exist. But for four to five hours Berkshire Lowland Search and Rescue went through a training scenario in which she needs to be found. I was invited by Lowland Rescue to attend the evening’s exercise to learn more about its operations and use of radio. Part of the reason the training scenario is so detailed is that rescue agencies draw on a vast amount of data on missing persons cases – providing would-be rescuers with valuable information about the likely behaviour of the individual(s). For example, a despondent person like ‘Emma’ is likely to seek out areas of shelter or solace, so the search teams will focus on places of worship and scenic points on higher ground. In Berkshire Lowland Search and Rescue’s command vehicle Chapman runs through the typical procedure. “We get an initial call from the police, who dial into a one-number system. Our police search adviser will then liaise with one of the search managers. We’ll call out the team by text messaging over standard mobile phones, using a database of members. It’s web- based, so any search manager can log in and see the responses. Before the search can start the search area has to be defined and divided into segments, which can then be allocated to different groups. Chapman says that in a real scenario they aim to do this within 20 minutes. The process is made easier through the use of MxMap, a web-based Ordnance Survey mapping tool and SARMAN, a mapping system developed specifically for the needs of search and rescue teams. The latter is used to create the search area, based on the probability statistics that best match the missing person’s profile. Once this is done the search manager briefs the team leaders, who then update their teams. The search for Emma will focus on mostly urban areas, with some woodland. Once the search begins I notice that a lot of radio traffic involves the teams reporting when they are in position and about to start searching their section. Chapman explains that this is because they are required to keep an audit of who searched where and when. In addition, it can take time for people to get into position and this knowledge helps the organisation schedule volunteers’ breaks. Chapman adds that sometimes, because they explore off the beaten path, they’ve discovered the results of crime – such as stolen property, credit cards, caches of laptops and even a safe once. 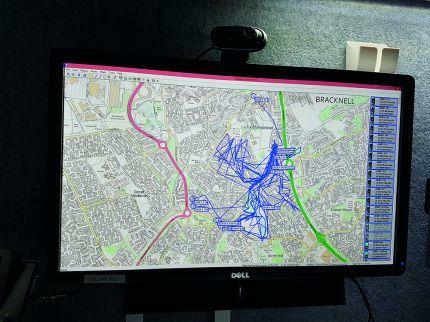 Modern technology has helped speed up the search process as it allows the teams to better prioritise search areas. In many cases the police can ping the missing person’s mobile phone with the help of mobile network operators. However, while this can be useful it all hinges on where the mobile phone masts are. In favourable circumstances it is possible to narrow down a missing person’s location to an arc from a mast. The command vehicle has a PC with dual monitors, two in-vehicle radios with handheld mic (so the search manager can run different channels), and a mobile phone handset with a pay-as-you-go SIM. It also has a diesel generator that can run off the vehicle’s fuel tank if need be, a telescopic/pneumatic radio mast and a roof-mounted antenna. Additionally, it features an external outlet on a long cable to plug into a normal power socket and UPS backup. The command vehicle has been retrofitted by Berkshire Lowland Search and Rescue because it is second-hand, but was already semi-converted when the organisation bought it. Westwell says that it takes just 10 minutes to get the command vehicle on air and that its 4G connection provides the backhaul to allow the incident control vehicle to appear as another node in the network. Its neighbours are predefined as being the macrosites within Berkshire county. The volunteers’ handsets are set to look for another node should the vehicle’s signal strength drop below -108 dBm. Lowland Rescue is made up of 36 teams across the UK with more than 1,800 professional and qualified rescue volunteers. It sets the standards for search techniques, first aid, communications and navigation. Being a volunteer involves a great deal of commitment. Becoming an operational search technician takes about three to six months. In addition to searching for lost members of the public volunteers also run fundraising campaigns, give medical care at events, and provide training to other organisations. Just as much commitment is required by Lowland Rescue’s canine members and their handlers. Westwell explains how he recently assisted with the requalification of an area dog. To pass the dog and handler have to find up to four people in a 50-acre area within 90 minutes. He adds that it takes numerous four to five hour sessions, two to three times a week to get a dog ready for assessment to a national standard and that they need to be re-assessed every two years. Westwell adds that it was a love of dogs that initially got him involved with Lowland Rescue. He acquired two dogs in 2009 and stumbled across the organisation. His vehicle, in addition to a rather sturdy and comfortable- looking dog cage, is filled with the tools of his vocation. His time as a radio amateur and working at O2 made him a natural choice when it came to selecting Lowland Rescue’s communications officer. Like the SMS messaging, Berkshire Lowland Search and Rescue’s radio handsets and infrastructure are managed through web-based applications (RDAC from Motorola for infrastructure) and Westwell shows me how it’s possible to track the handsets’ locations on Google Maps and see the operating temperatures and statuses of the macro sites. late 2013 when the organisation decided to use digital radio. He adds that each team is responsible for fundraising for and procuring their own radio equipment. Lowland Rescue provides guidance on how to use the hardware and software and configures it for use by the individual teams. “When we chose the system 30 months ago DMR Tier III was very much in its infancy. I don’t believe there was a working offering from any of the mainstream suppliers,” he adds. “Motorola LCP gave us what we wanted: a network with multiple talk groups, which we were able to regionalise. Lowland Rescue’s LRnet (Lowland Rescue Network) is a multi-region IP-based network, which uses a MOTOTRBO Linked Capacity Plus system. Westwell says that half of Lowland Rescue’s teams are engaged in the project. The main benefit of the network is that it is much easier to see where assets are and contact them if required, and this cuts down on unnecessary voice traffic. It also means that it’s easier to communicate with and bring in volunteers from further afield if needed. Westwell says that the “huge benefits” over an analogue system are: enhanced security, additional capacity, and GPS functionality. He expects the number of fixed MOTOTRBO DR 3000 and SLR 5500 repeaters used by the network to increase by four or five (from the current 14), and the number of mobile repeaters to grow from six to probably 10 by the end of the year. However, the idea is that increasing the macro network will reduce the need for mobile repeaters. Westwell explains that Lowland Rescue has introduced a standard talk group plan so every radio is the same. The organisation has 11 common talk groups and then each team has two of their own. However, some counties have more than one team, which only happens when they have separate foot and K9 teams, in which case they have a total of four local talk groups, two for each team. Westwell adds that all Lowland Rescue volunteers are trained how to use their radios and that this includes the phonetic alphabet, the correct way to format verbal messages, and the use of pro-words. LRnet’s fixed sites are on technically- assigned licences, but Lowland Rescue asks for exclusive use where it can get it and hasn’t encountered any issues with interference. The radio system operates in VHF – mid- and high-band. Maintenance is simple, consisting of “just an annual dust off”. The network has two core routers in different locations for resilience – each of which is capable of running the network on its own if the other fails. Westwell says that ADSL lines are its biggest problem as they’re long and can be unreliable. To address this issue back in June Lowland Rescue decided to connect its latest node in Great Tew, North Oxfordshire to the rest of the network using a 4G dongle rather than ADSL for backhaul. It has done the same with its site in Milton Keynes. Westwell states that “the 4G dongles work great, with fantastically low latency” and that they are probably more reliable than ADSL. Another reason the organisation has opted for 4G is cost. Each 4G dongle is just £10 per month compared with £30 for an ADSL line, as the data use is only around one gigabyte per month, even on a busy site. Returning to the evening’s exercise, ‘Emma’ was missing for two-and-a-half hours before Berkshire Lowland Search and Rescue’s team ‘found’ her in the grounds of Easthampstead Baptist Church. While I didn’t witness a real search it was clear to me that every effort is made to make training as close as possible to the real thing. I’m told that for every hour spent searching Lowland Rescue’s members spend 10 hours training. The organisation collectively searches around 82,794 km2 every year – an incredible task made easier through the use of digital two-way radio.